What does this sign mean, and where is it from? The above seems very likely a copyrighted photograph that was (a) published without attribution and (b) cropped. I am hoping that crediting "JL" and showing the entire image is not offending. It is clear at least where the image was captured and that the central part of the sign, assuming symmetry, is more likely octagonal rather than hexagonal. This is the 5th sign on the "regulatory signs" section of the Ontario Drivers Handbook. This is far stricter than "No Parking" since parking involves leaving your car. In a No Stopping zone you can't pull over to let someone out or pick someone up, for example. According to Wikipedia, it is a Canadian form of "No Stopping". I guessed it from the grammar of signs - it is prohibiting something, and that something is represented by an octagon, the shape of a stop sign. As per the Vienna Convention on Road Signs and Signals, the octagonal shape as shown in this diagram is used only for a "Stop" sign. Normally a stop sign would be red in color and also include the word Stop, but given that this is only a representation of a stop sign rather than an actual stop sign it's not surprising it doesn't. Under the same convention, the red circle with a line through it is an indication of "Do not". Thus this is some form of variation on "Do Not Stop". 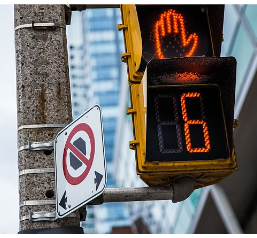 Without knowing the full context (eg, what country it's from) it's difficult to be sure, but this actually appears to be a Canadian "No Stopping" sign, which would be placed along the side of the road to imply that you can not stop (or park) along that part of the road. The Vienna convention does not define a "No Stopping" or "No Parking" sign, so the signs that countries use for these vary far more than normal road signs. Seems like "No stopping" sign in Canada (at least in Nova Scotia): Traffic Signs Regulations made under Section 88 of the Motor Vehicle Act . Not the answer you're looking for? Browse other questions tagged canada road-signs or ask your own question. What does “in good health” mean with respect to Canadian entry?